An RGB camera that stores three channel data in a 1280×960 resolution. This makes capturing a color image possible. An infrared (IR) emitter and an IR depth sensor. The emitter emits infrared light beams and the depth sensor reads the IR beams reflected back to the sensor. The reflected beams are converted into depth information measuring the distance between an object and the sensor. This makes capturing a depth image possible. 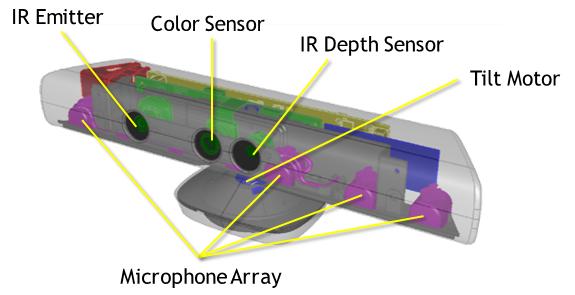 A multi-array microphone, which contains four microphones for capturing sound. Because there are four microphones, it is possible to record audio as well as find the location of the sound source and the direction of the audio wave. A 3-axis accelerometer configured for a 2G range, where G is the acceleration due to gravity. It is possible to use the accelerometer to determine the current orientation of the Kinect. Accelerometer characteristics A 2G/4G/8G accelerometer configured for the 2G range, with a 1° accuracy upper limit. The resolution of the depth stream is dependent on the frame rate, and is specified by the DepthImageFormat Enumeration enumeration. Similarly, the resolution of the color stream is specified by the ColorImageFormat Enumeration enumeration. See the depth space range section to see the depth data ranges as well as values for out-of-range data. via Kinect for Windows Sensor Components and Specifications.